Based on a true story, set in Iran in 1986, Soraya’s husband made all kind of demands to get rid of his wife and two daughters, to marry a younger woman. Soraya refused to grant him a divorce because he wasn’t going to provide alimony for her or her children. Determined to be free of his wife, Soraya’s husband seized an opportunity that arose when one of the village’s women died and the men asked Soraya to do house chores for the widow. Soraya’s husband started a rumor about his wife infidelity and ended up forcing false witnesses to provide their testimonies of Soraya’s betrayal. 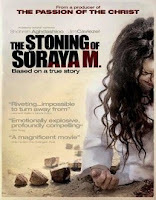 With enough witnesses against her, Soraya was found guilty and sentenced to death by stoning. This movie made my blood boil. I just could not believe that that man could fabricate such lies to suit his purposes and convince everyone in town of them. That’s the power of a rumor! In this case the rumor had tragic consequences. Even her two sons were given stones to throw at her! I thought the director of this movie was going to sugar-coat the stoning, but he didn’t shy away one bit. Those scenes are as brutal as they are real. In places where women have no rights, their very lives are in the hands of men capable of such atrocious acts.